Wishing you and your loved ones peace, health, happiness and blessings at Passover, Easter and always! If you are interested in selling your property or you know someone who is planning to sell their Brooklyn New York property, whether a single family residential property, an apartment building, a commercial property, mixed use, multi family, coop or condo, vacant land or a development opportunity, call or email us. You will be very happy that you did. When investing in Commercial Real Estate, it is essential to have an understanding of Net Operating Income. Net Operating income or NOI is a calculation used to determine the profitability (or lack of) of real estate investments that generate income. NOI helps to determine how much a property is worth. NOI is used in determining the Capitalization Rate (rate of return on the investment) which helps in calculating a range in value of a property and forecasting cash flows. NOI takes all revenue from the property, minus all reasonably necessary operating expenses. Keep in mind that NOI is a before tax calculation excluding principle and interest on a loan, capital expenditures, depreciation and amortization or EBITA. An easement is a property right that gives it’s holder an interest in land that’s owned by someone else. Land affected by an easement is called a servient estate, while the land or person benefitted by the easement is known as the dominant estate. Most easements are affirmative, which means that they authorize use of another’s land. Easements are usually created by conveyance in a deed or some other written document such as a will or contract. Although permanent easements are the norm, they can be terminated. Easements of limited duration are commonly used to provide temporary access to a dominant estate pending the completion of construction work. All 5 boroughs of New York City, Manhattan and the surrounding boroughs of Brooklyn, Queens, The Bronx and Staten Island are densely occupied with buildings of every property type whether single family residential, multi family residential, mixed use, commercial, industrial, condominium or cooperative buildings or skyscraper office buildings. For this reason, air rights have become so very important to property owners, investors and developers. 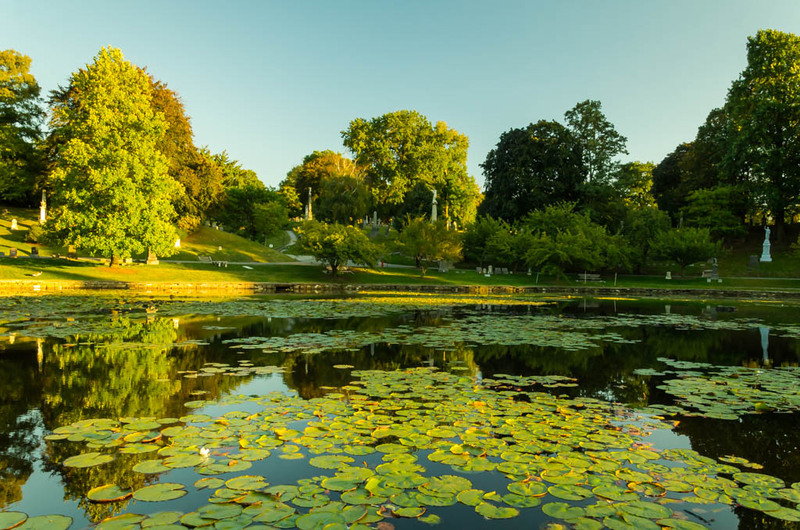 An estate property is the property owned by a person who is recently deceased or who may be going in to assisted living. If you need to sell real estate in order to help settle the estate of a family member, having the right legal representation and right real estate brokerage representation is very important. Are You Planning To Sell Your Property in 2019? Whether you are a property owner planning on selling your residential, commercial or investment property in Brooklyn, Manhattan, Queens, the Bronx or Staten Island, you need every advantage possible to locate the best qualified buyers who are motivated to purchase your property. Just a few weeks ago we at Accord Real Estate Group announced the launch of our latest website and mobile version. We continue to be a technologically advanced real estate brokerage company year after year. We are internet marketing experts dedicated to bring the absolute best exposure to our client’s properties to locate interested and qualified buyers. 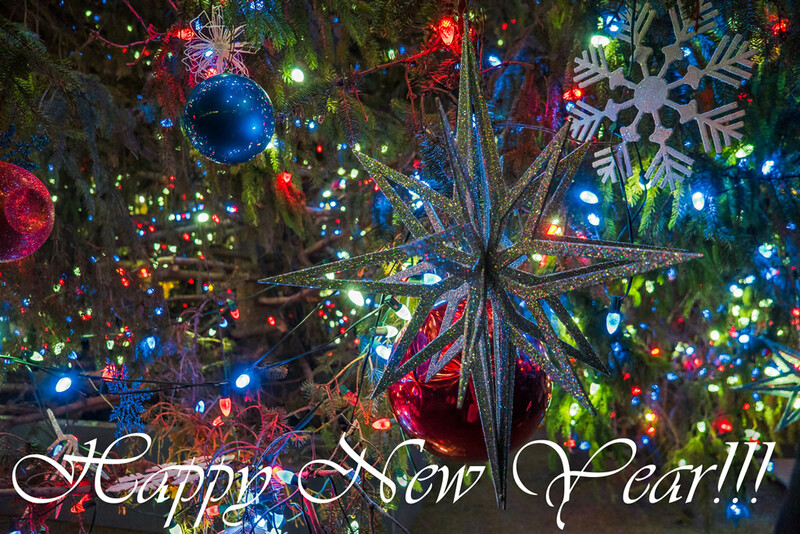 Wishing you a joyful holiday season and Happy New Year filled with peace, hope, happiness and love! We are thankful for the privilege to serve our clients, and their continuous support and business! May 2019 be successful year for all of us! Your Brooklyn Neighborhood Real Estate Broker. Long Island City is a residential and commercial neighborhood located on the western tip of Queens, New York. Long Island City is bordered by Astoria to the North, East River to the West, Hazen Street, 49th Street and New Calvary Cemetary in Sunnyside to the East and Newtown Creek to the South (which separates Queens from Greenpoint, Brooklyn). The mere buzz of tech giant Amazon possibly deciding to put a headquarters campus in Long Island City created a condo gold rush. Now that Amazon has made it official with their new headquarters to be built in the area of Vernon Boulevard and 44th Drive, the excitement is real and the future looks bright for LIC Queens and New York City. Amazon has agreed to donate space on its campus for a tech startup incubator, for use by artists and industrial businesses, donate a site for a new public school and will also create “infrastructure improvements” and green spaces. Amazon’s move to LIC Queens will bring more than 25,000 jobs and it expects to invest $2.5B in the LIC headquarters which will encompass 4M square feet of office space with a possibility of expanding to 8M square feet. Brooklyn’s Clinton Hill has some of the most historic, architecturally important residential houses in the borough and many gorgeous new residential and mixed use development buildings as well. This neighborhood is exciting and is attracting many to live and play there. Commercial, residential and mixed use buildings made of wood instead of steel and concrete? 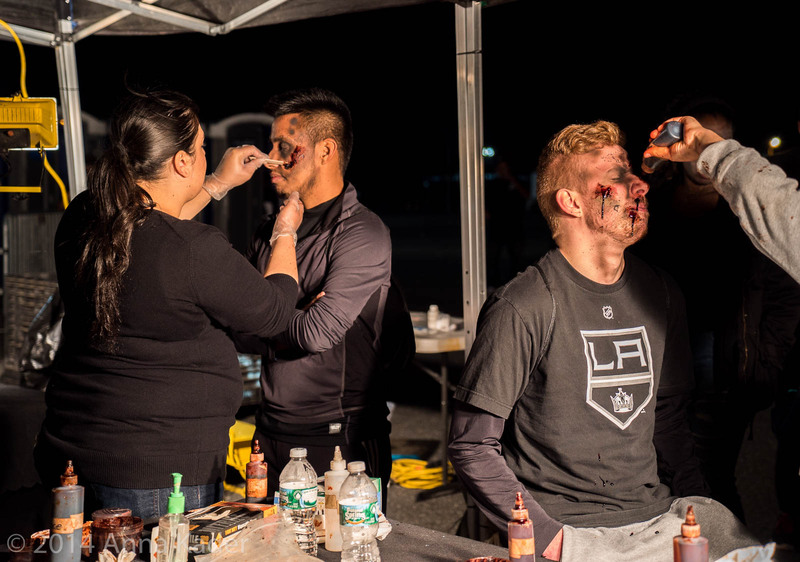 Yes, this trend is gradually catching on in New York and across the country. The idea of what a wood building can be is expanding. With new state of the art materials, systems and techniques the design community is excited about wood projects, their beauty, strength, versatility and sustainability. The Towers, one of the jewels of the Jehovah’s Witnesses Brooklyn Real Estate Portfolio has been sold. Located at 21 Clark Street, The Towers is a former Hotel located in the Brooklyn Heights Historic District, Brooklyn NY. The buyer for this magnificent 1920’s Venetian palazzo style building is Kayne Anderson Real Estate Advisors who reportedly purchased the building for approximately $200M. The Towers structure is 16 stories in height and 313,768 square feet in size. Al Rabil, Kayne Anderson managing partner and CEO said of the building “meticulously maintained since it’s inception in the late 1920’s, the towers is a unique redevelopment opportunity to introduce modern luxury living for seniors in Brooklyn”. Watermark Retirement Communities is partnering with Kayne Anderson Real Estate Advisors on the project. The new owner is committed to upholding the property’s unique legacy. In the hotel’s heyday it was advertised as the aristocrat of Brooklyn Hotels. The Towers was designed by Starrett & Van Vleck, the same architecture firm that designed the Manhattan Flagship Stores for Saks Fifth Avenue and Lord & Taylor. The importance of your personal and professional reputation in the Real Estate business cannot be overstated. I am sure you are well aware of it, however please let me share with you my thoughts. Rome was not built in one day, however, ultimately how you build and develop your personal and professional reputation carries much more weight than any brokerage company or company brand that you choose to affiliate with. It’s all about you and only you and how you conduct yourself. One of several key elements in working towards your long term success in the real estate brokerage business today is the size and quality (we’ll get back to this) of your database. Your database can include a pipeline of perspective new client listing leads to be cultivated into a saleable inventory of great properties to be marketed and sold, your sphere of influence (past sellers and buyers who are your advocates) and the group of clients and customers who you are currently servicing. The ideal position to be in when choosing the best qualified buyers to work with who invest in existing properties or who develop ground up is having a property or properties in your inventory that suits the needs of a range of buyer types. If you are not in the position of having being hired as the broker with the exclusive right to sell, to handle the marketing and sale of an investment property for your client then you will need to contact other brokers with the listings on properties that your buyers are interested in purchasing. At Accord Real Estate Group we mentor our agents, we offer professional training to our agents and we encourage our agents to become proficient at accumulating their own saleable inventory of properties to be marketed and sold. This blog is a continuation in the series of blogs regarding the actual business of the real estate brokerage business. In real estate brokerage there are two sides to a transaction, i.e. the listing side, where a broker is hired to represent the seller and their interests and the selling side where a salesperson works with the buyer to find a suitable property for that buyer’s needs. For the purposes of today’s blog, we are focusing on the listing or marketing consulting side of a real estate transaction and what that job entails. The importance of branding yourself in today’s real estate industry can not be overstated. In our everyday lives we approach everything that we do and all of the daily interactions that we have with people in our own unique way, leaving our own personal touch and impression. Have you ever wondered what your property value is in today's real estate market? At Accord Real Estate Group, we pride ourselves on the accuracy and reliability of our BPO reports, property valuation, appraisals and market evaluations. One of the most wonderfully scenic and yet still affordable areas in Brooklyn is Fort Hamilton, on the south end of Bay Ridge. December 10th of 2016 we blogged about Bay Ridge and it’s many assets as a top Brooklyn neighborhood including majestic views of The Verranzano Bridge and The New York Harbor. 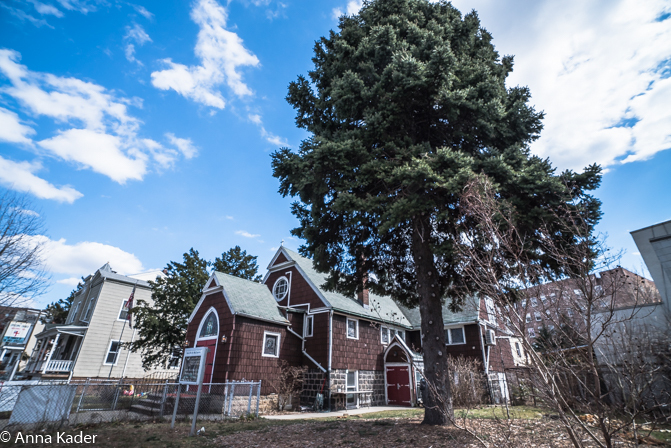 Slowly but steadily this gem of a neighborhood is catching the attention of developers. Just blocks away from amazing Brooklyn Bridge Park, with a unique urban small town feel and in an industrial waterfront location, the Columbia Street Waterfront district or CWD is one of Brooklyn’s New York smallest and fastest growing neighborhoods! CWD is sandwiched between Red Hook and Cobble Hill (what wonderful neighborhoods to be next to) and going from East to West is just 22 blocks wide. For years we’ve been blogging about Brooklyn’s booming residential, multi-family and mixed use market. The office building market in Brooklyn, NY has become a big part of the borough’s growth in popularity as not just a great place to live, but a great place to work as well. There are so many real estate brokerage companies doing business in Brooklyn, NY today. Many companies are reputable but unfortunately many companies are not. 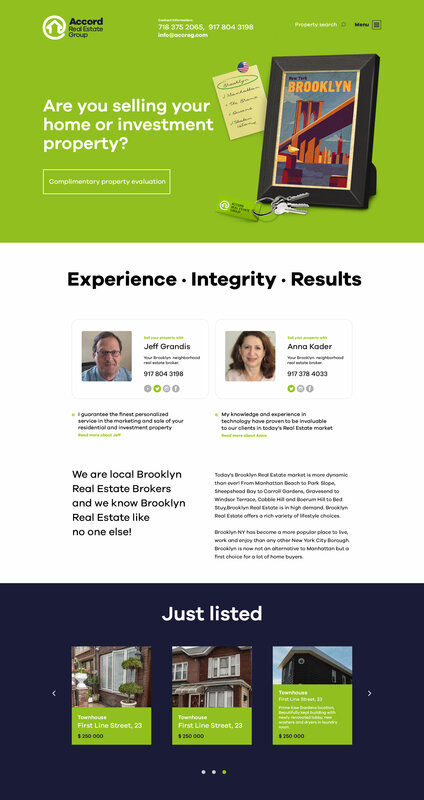 The business of real estate brokerage today in Brooklyn New York or any other requires outstanding communication skills, a keen understanding of the market and how to keep your transactions on track and everyone involved positive and confident in the outcome. When searching for the right brokerage company to be hired to handle the marketing and sale of your real estate assets for the best price it is crucial to choose the right Real Estate Broker / Agent. Ask yourself the following critical questions that property owners need to ask before choosing your broker. Whether you are a a property owner or an experienced investor who is planning to sell a property we have the following top 9 real estate tips for you. We hope that you will find them useful. Brooklyn NY has the most dynamic and diverse neighborhood markets to be working in as a real estate broker. Jeff Grandis, broker at Accord Real Estate Group has been appraising, marketing and selling Brooklyn properties for over 28 years. Residential housing in today’s market means addressing the needs of many kinds of tenants including empty nesters, just out of college, students , millennial, young families and young professionals. These tenants are looking for space that offers great amenities and is specifically designed for their unique needs. Industry City in Sunset Park, Brooklyn NY is located West of the Gowanus Expressway and totals 16 buildings. 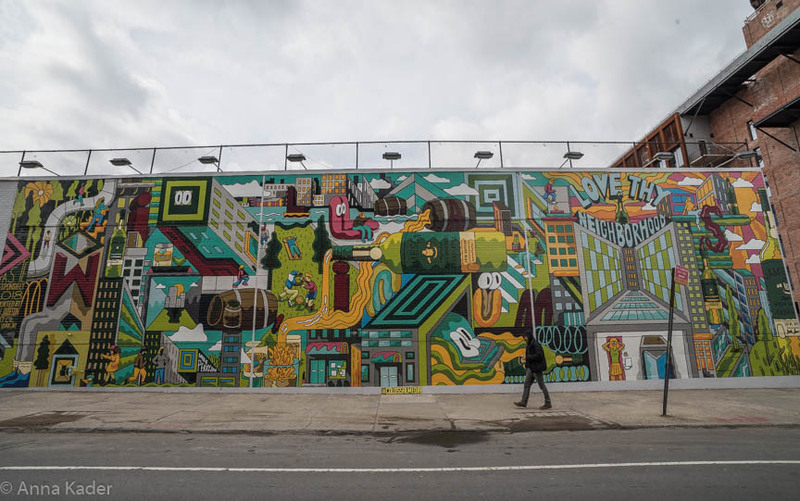 The looming shutdown of the “L” train has helped to shift some market forces to a certain extent in favor of the Bushwick, Brooklyn neighborhood. Similar to the boom in Williamsburg and Long Island City, waves of new residents are drawn to the easy commute into Manhattan and relatively reasonable pricing for housing. 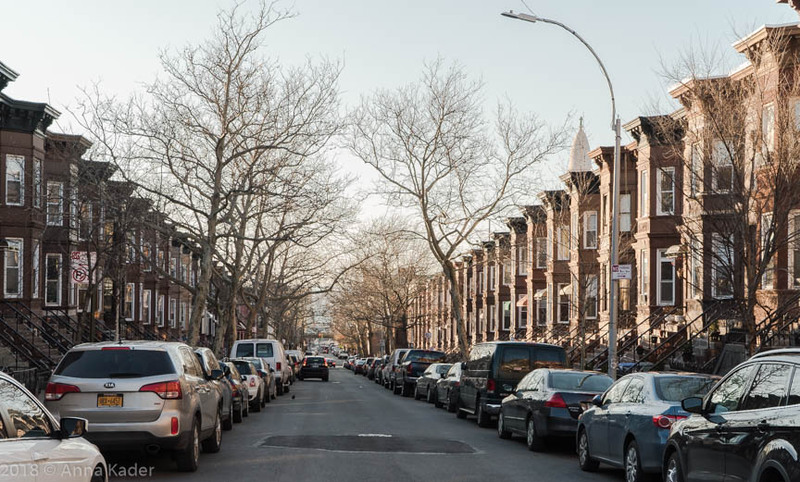 The condominium and home renovation market in Bedford Stuyvesant is hot and getting hotter as young entrepreneurs and young families continue to choose Bedford Stuyvesant as one of the top Brooklyn neighborhoods to plant roots in. Oosten, a new Williamsburg residential development project located at 429 Kent Avenue is nearing completion after being in the works since 2013. Chinese developer XIN Development and Dutch designer/ architect Piet Boon have put together a wonderfully different project. The main feature that distinguishes Oosten from other residential projects is a huge interior open courtyard that the building is built around. A streetcar line called The Brooklyn Queens Connector is receiving big support from Business and Government. The proposed route for the streetcar line would run from Sunset Park through Gowanus, Red Hook, Cobble Hill, Brooklyn Heights, Downtown Brooklyn, Dumbo, Vinegar Hill, The Brooklyn Navy Yard, Williamsburg, Greenpoint and on to Long Island City and Astoria Queens. Anbau Enterprises, a high end condominium developer has improved their opening bid of $75M to $130M for the 387,000 square foot Pineapple Walk property which stretches from Henry Street to Cadman Plaza West. 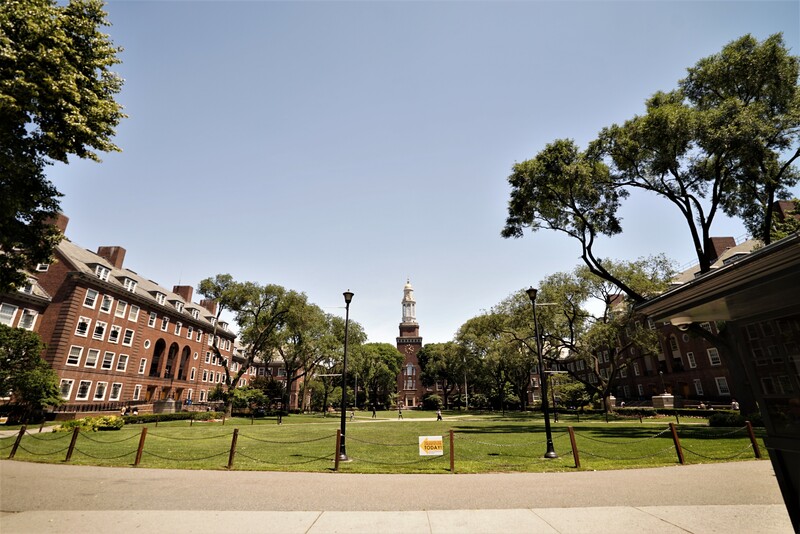 The location is superb, with the Brooklyn Heights historic district to the west and a lovely park to the east. For real estate companies in Brooklyn, real estate brokers in Brooklyn and real estate agents in Brooklyn who have an interest in the Dumbo and The Brooklyn Tech Triangle neighborhoods, this blog will be informative. For those Real Estate Companies in Brooklyn, Real Estate Brokers and Real Estate Agents in Brooklyn who follow the latest news in the Crown Heights North Historic District, the Landmarks Preservation Commission is very close to approving the development of a new 4 story residential building at 906 Prospect Place. Quinlan Development Group and Joint Venture partner Land & Technology have purchased a 10 story building located at 41 Flatbush Avenue for $89.4M. To all Brooklyn Real Estate Companies and Brooklyn Real Estate Agents, let’s start out with the good news. This blog is a follow up to our blog on August 20th 2015 regarding Hudson Companies Brooklyn Heights proposed Brooklyn Public Library development. 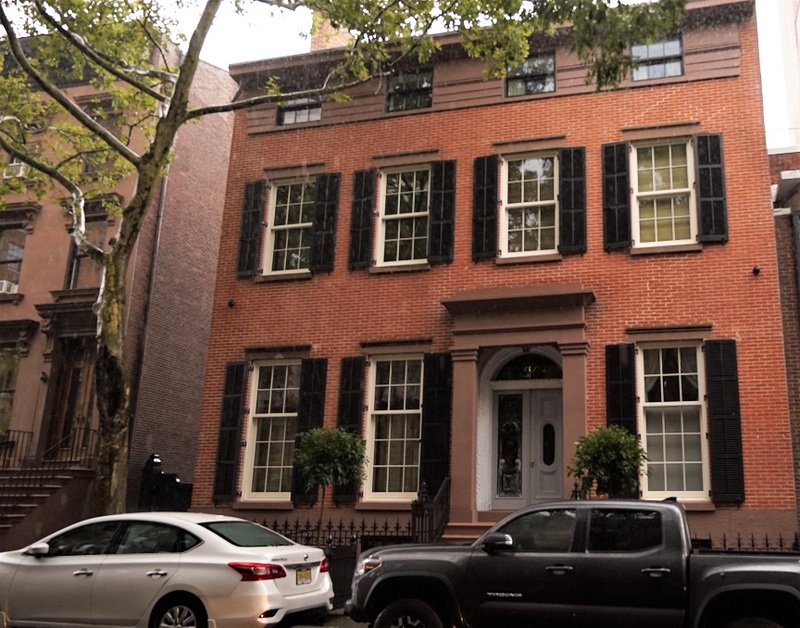 The Brooklyn Heights Historic District Real Estate market is booming as many Brooklyn real estate companies and Brooklyn Real Estate agents are aware. Attention all Brooklyn Real Estate Companies and Brooklyn Real Estate Agents who service the Crown Heights neighborhood. Real Estate in Brooklyn update. Interesting news for real estate companies and real estate agents in Brooklyn who service the Prospect Heights neighborhood. The legal battle continues over SUNY’s sale of Long Island Community Hospital properties to Fortis Property Group. The Supreme Court Appellate Division in Brooklyn will decide whether to overturn SUNY’s decision to sell the hospital property to Fortis. The Concerned Physicians of LICH is one of the groups fighting the sale. In our blogs dated May 10th 2013 and September 19th 2013 we have been following the transformation of a section of the Fort Greene neighborhood formerly known as the BAM Cultural District and is now called Brooklyn Cultural District. In this blog we will update our readers on the progress of this neighborhood into a cultural district for the 21st Century. 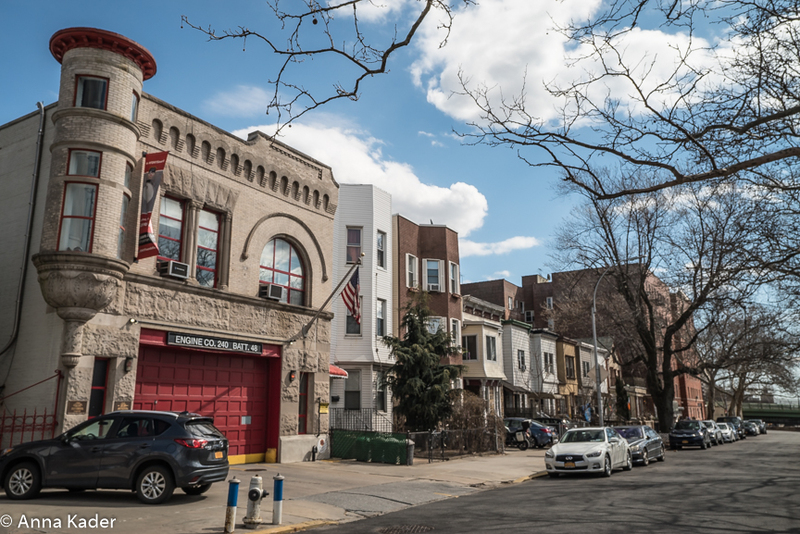 This blog is a follow up to our March 5th blog on Crown Heights North Phase Three moving towards historic district status. This is exactly what the Landmarks Preservation commissioner is scheduled to do in late March. The purpose of the visit is to decide whether to create a historic district in Sunset Park. 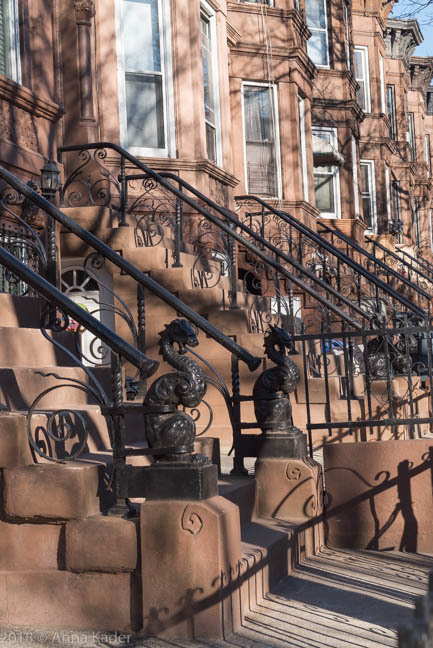 Sunset Park has a magnificent housing stock of Brownstone, Limestone and gorgeous brick homes of red, orange or gold colors built from 1890 to 1910. During the Bloomberg years, Brooklyn experienced rapid residential growth from Red Hook to Downtown Brooklyn To Williamsburg. There is a planned development project that the Brooklyn Bridge Development Corporation is accepting and reviewing requests for proposals from Developers interested in doing the project. The project being proposed is for two residential towers to be built on Pier 6 at the parks southernmost edge. The towers would be 315 feet high and 155 feet high for a total of 430 residential units. Investment Property sales for the 1st half of 2014 is up 38% from the first half of 2013. As a young real estate agent in the business I came to appreciate many of Brooklyn's beautiful neighborhoods and the rich architectural history of some of the homes and buildings. Now, many years later as an owner of a real estate company Accord Real Estate Group, I am still captivated by the architectural treasures that we have in Brooklyn. 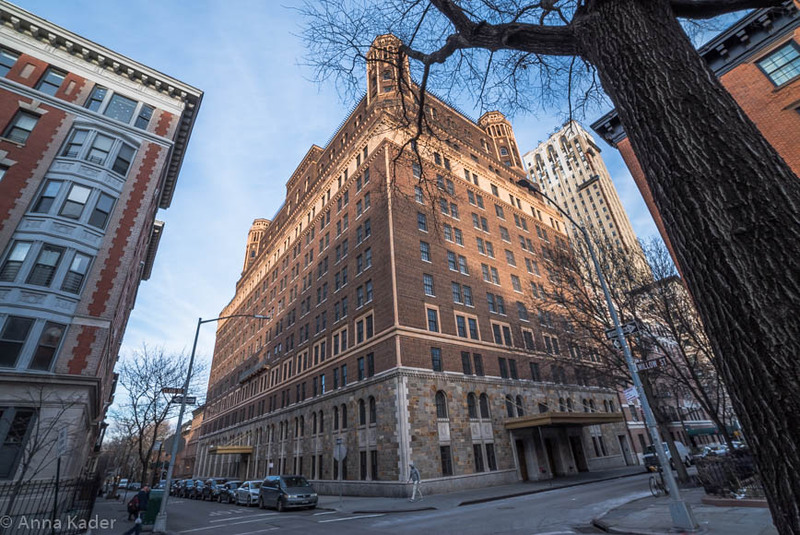 In June and July of last year we blogged about the Jehovah's Witnesses sale of their Brooklyn properties including the Bossert Hotel on Montague Street. The hotel was sold for $81 million to Mr. David Bistricer. In last year’s blogs we also commented on the wonderful ripple effect the relaunch of the hotel will be to local merchants who will benefit from hotel guests spending money in the area. A developer from Milan, Italy “Est4te Four” with offices in London and West Hollywood has their eye on purchasing a 4th development site in Red Hook, Brooklyn. Their new acquisition 44-62 Ferris Street is a parking lot which also fronts Wolcott St. and Sullivan St will be coupled with 219 Sullivan St. These combined properties have incredible waterfront views of the lower Manhattan skyline. Two pollution plagued properties in Greenpoint Brooklyn have been sold to developers who must go through a costly cleanup process. The vintage Arte Modern style former Harte & Co. factory building property located at 280 Franklin St. has been sold. The buyer, Bo Jin Zhu plans to build a 400 unit apartment building with 200 parking spaces. The building will have affordable apartments as well as market rate units. If you read our blogs you know that as Brooklynites Anna and I truly enjoy the uniqueness, history and wonderful energy and diversity of Brooklyn New York neighborhoods. We as real estate brokers marvel at the tremendous demand and interest there is in Brooklyn Real Estate. We at Accord Real Estate Group are proud to say that our services are sought after by and respected by property owners who reach from one end of Brooklyn to the other. At any given point in time we handle the marketing and sale of properties in Sheepshead Bay, Fort Greene, Bedford Stuyvesant, Stuyvesant Heights, Midwood, Homecrest, Red Hook and East Flatbush, just to name a few. As a kid growing up in Brooklyn, I first saw this truly unique and fairytale like home as a teenager. I didn't know then, that I would become a real estate broker, but I loved showing this curious and unusual home located at 8220 Narrows Avenue in Bay Ridge to my friends, from the outside, of course. We called it different names and one name is the gingerbread house. This comes as no surprise to us, your local real estate brokers who have listed and sold thousands of Brooklyn properties over the course of 27 years. Crown Heights Brooklyn is a neighborhood of cultural and religious diversity, of century old Brownstones, of new glass and steel Loft buildings, of Brooklynites that have been here for decades and now becoming a neighborhood with many young families, young professionals and artists. As we reported in December of 2013 the presence of the Barclay Center a tremendous increase in interest and foot traffic has spurred the development of new hotel construction in the area. Two new hotels coming to the neighborhood are the Marriott Autograph Collection Hotel and the Intercontinental Group's Even Hotel. Along with this spurt of luxury hotel development, there is also an expansion of the BAM Cultural District taking place with the construction of The Polonsky Shakespeare Center and plans for 1,000 apartments to be built in this area in the near future. There is clearly a Barclay Center ripple effect that has been and continues to be underway on Fifth Avenue. On July 18th of 2013, we reported that developers RFR and Kushner Companies had purchased 6 buildings in the Dumbo neighborhood of Brooklyn from The Jehovah Witnesses. It is expected that this project will produce as much as 1.2 million square feet of commercial space. This commercial space would be a tremendous boost for the Brooklyn push to create a Tech Triangle in the Dumbo, Brooklyn Navy Yard and Downtown Brooklyn neighborhoods where technology companies large and small could find a home. In Downtown Brooklyn, on the corner of Boerum Place and Atlantic Avenue, there are currently 3 projects planned with 2 projects of the 3 already underway that will dramatically spruce up this corner of the neighborhood. 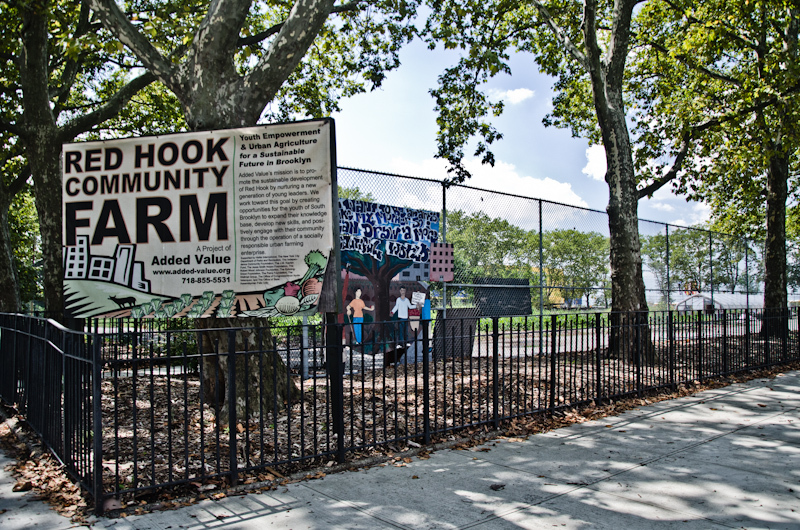 Red Hook, Brooklyn, New York has been a growing and expanding neighborhood with real estate in high demand before hurricane Sandy occured. Home to a Fairway supermarket on the water,an Ikea superstore with a waterfront park as well as a ferry to Manhattan, the demand is still strong for Red Hook properties and Red Hook continues to attract homebuyers and investors despite hurricane Sandy. Some buyers with a vision of building both residential housing and commercial buildings believe in the unique and trendy feel of Red Hook. Two brothers, Robert and John-Tom Seetin who for years have been doing high end custom metal fabrication,architectural metals and millwork are building a new home for their business on Coffey Street in Red Hook.The Seetin brothers decided to Relocate their business from Williamsburg, where have been running their business for the last 15 years. 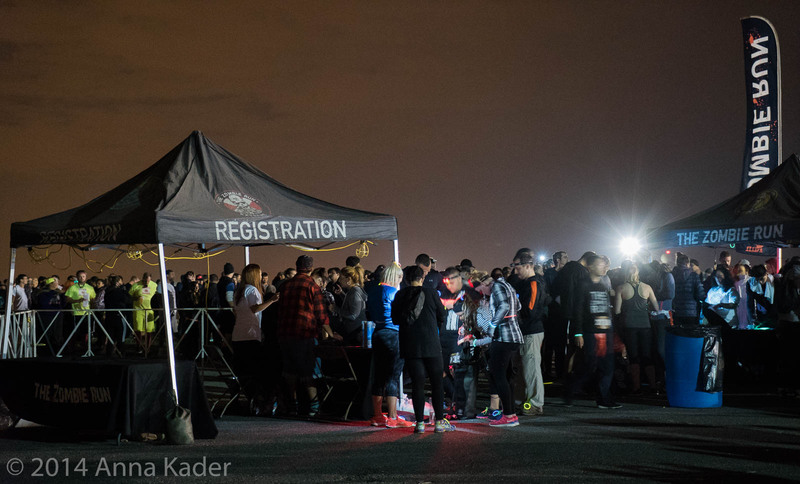 Sandy was not going to stop them from relocating to Red Hook. Their new three story building will have a fortified foundation, strong grade beams and piles, flood vents on the walls and a crane to lift up factory equiptment if there is a threat of flooding. 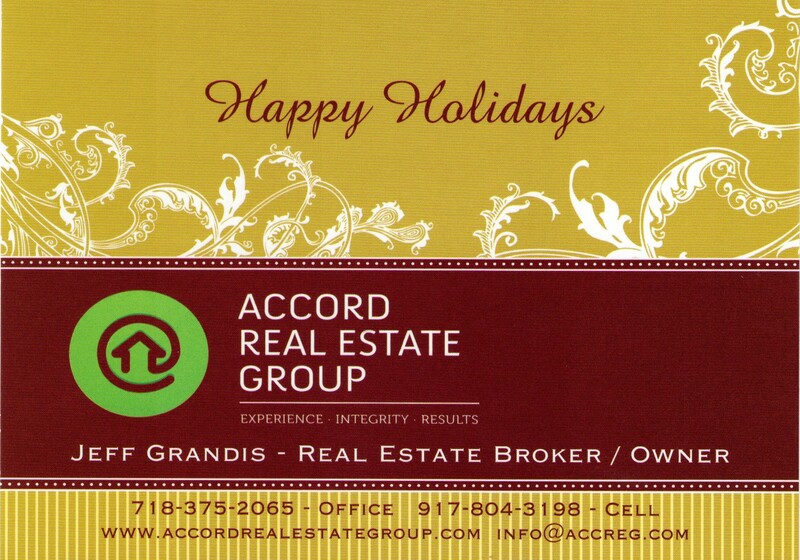 Merry Christmas and A Happy New Year From Accord Real Estate Group. This is such a great time of year in New York. We have such a festive looking city. There is no other quite like it. Brooklyn is in a class all it's own. Brooklyn is one heck of a festive looking borough. Just take a drive to the Dyker Heights neighborhood where the Christmas lights, annimated Santas, Elves, Raindeer and Snowmen are world class in their presentation. From 75th Street to 86th Street and from 10th Avenue to 14th Avenue you will be truly amazed at the passion and enthusiasm this neighborhood and it's residents have for Christmas and The New Year. If you are with family, friends, all of your loved ones (especially kids) for the holidays and you want to see how Brooklyn does Christmas, come and take a drive around Dyker Heights to see the lights. There may be a lot of cars oogling the lights and sights, but it is very civilized. Everyone is so friendly, you will have a great time. On Sunday December 15th a wonderful Duke Ellington/ Billy Strayhorn arrangement of The Nutcracker Suite, originally composed by Pyotr Ilyich Tchaikovsky was performed by The Brooklyn Jazz Orchestra at The Lafayette Avenue Presbyterian Church located at 85 South Oxford Street in Fort Greene, Brooklyn. There are two new trendy hotels being planned for construction just blocks away from Barclay's Center. or Happy Thanksgivukkah as it has been playfully nicknamed this year. The first day of the eight day festival of Hanukkah falls the day before the secular American holiday of Thanksgiving. This once in a lifetime convergence between the two holidays won't happen again until the year 79,811. We are deeply grateful and thankful to our clients who have placed their trust in us and our real estate brokerage company and listed their properties for sale with us. The Gowanus neighborhood situated between Park Slope and Carroll Gardens is gradually becoming gentrified and attracting the attention of investors. Large developers have been land banking commercial properties hoping for a rezoning of the neighborhood and thus allowing mixed use and residential projects to take the place of old warehouses and loft buildings. Two developers named Aaron Lemma and Asher Abesera formerly with Two Trees Management have purchased 68 and 80 Third Street (The former New York Vitrified Tile Co. building) off of Hoyt Street with the intention of creating boutique office space and artisanal shops. The location of these buildings is excellent, as a connecting street between Park Slope and Carroll Gardens. We frequently write blogs about how wonderful Brooklyn, New York is to live in, work in, have fun in and invest in. Developers, investors and retailers seem to have fallen in love with Brooklyn New York and many of her incredible neighborhoods, such as Bedford Stuyvesant, Prospect Heights, Clinton Hill, Boerum Hill, Cobble Hill, Williamsburg, Bushwick, Bay Ridge and Red Hook just to name a few. Sales figures indicate that in the investment property category of property types 498 buildings were sold in 362 transactions in the first half of 2013 and for the same period last year 426 buildings were sold in 301 transactions. 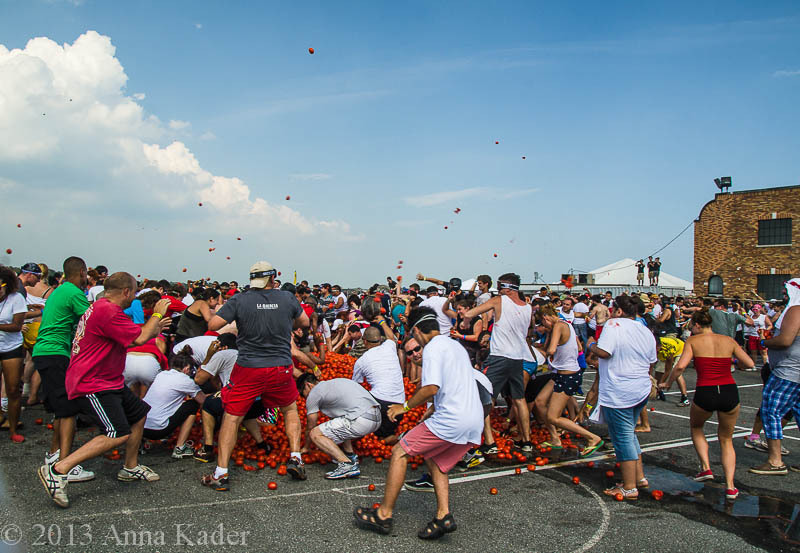 Every summer in Valencia Spain party seekers from all over the world flock to the town of Bunol to fight in a battle, called La Tomatina, where old rotten tomatoes are thrown in the streets. 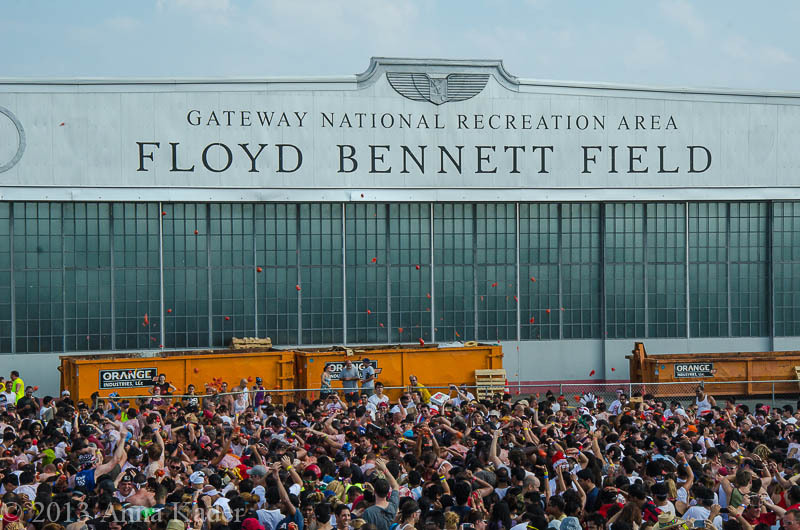 The New York City Tomato Battle which took place last Saturday July 20th at The Aviation and Events Center located at Floyd Bennett Field 3159 Flatbush Avenue, Brooklyn New York. 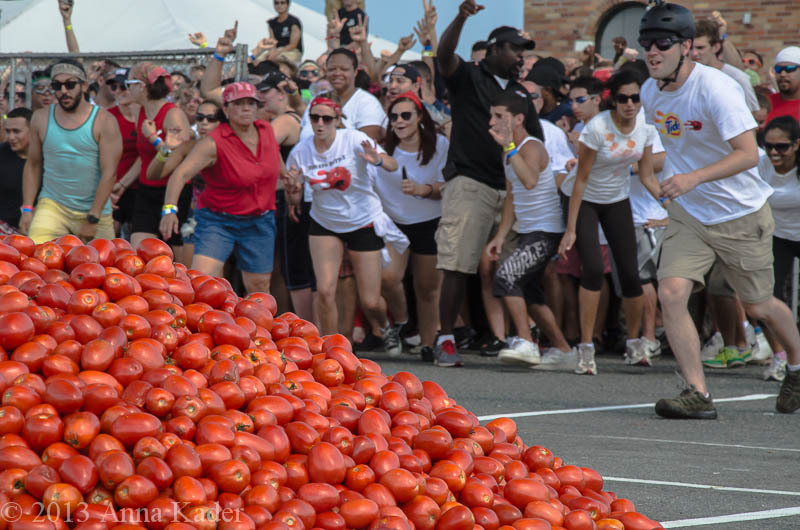 Inspired in part by the La Tomatina festival in Spain, this is the first time New York City has hosted a Tomato Battle event. Brooklyn has been an attraction for tech companies for decades. Now with the plan to create millions of square feet of commercial space in Brooklyn Tech Triangle it should change New York City position in the country as the second largest tech hub after the Silicon Valley to number one! The Brooklyn Tech Triangle consists of the space between Downtown Brooklyn, DUMBO and the Brooklyn Navy Yard. Amongst Brooklyn's many historic and wonderful neighborhoods, Coney Island has a rich and varied history. Coney Island was at one time the playground for the very wealthy, then a gathering place for the masses and then experienced a decline. Today Coney Island is attracting a new wave of retailers and restaurants. According to Mr. Zane Tankel, owner of the Applebee's restaurant chain, "Coney Islands time has come. It's the renaissance of the neighborhood". Mr. Tankel has just signed a 20 year lease on a Surf Avenue spot and this newest Applebee's location was set to open on June 17th. Commercial Real Estate in Brooklyn New York is more exciting than ever before. Today's blog touches on three different brilliantly creative, innovative and entrepreneurial, newsworthy occurrences in Brooklyn Commercial real estate news. 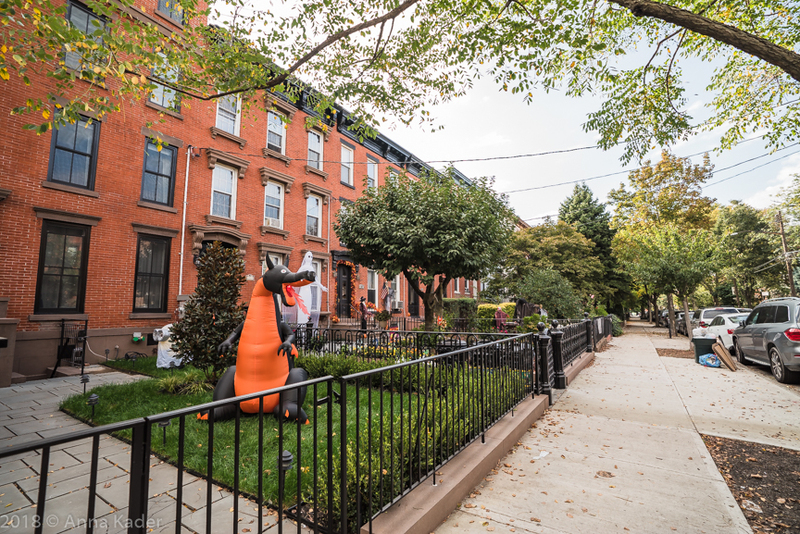 In our blogs we occasionally like to glowingly describe some of Brooklyn's many amazing neighborhoods. 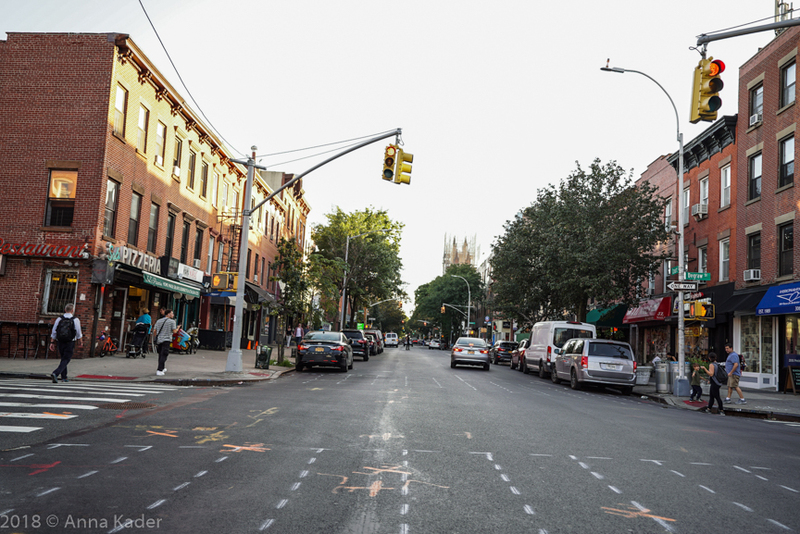 The subject of today's neighborhood blog is Boerum Hill. There is an incredible variety of homes for sale in Brooklyn, NY. Fort Greene Brooklyn, a historic neighborhood, considered to be part of Brownstone Brooklyn, has many gorgeous tree lined streets exhibiting an absolutely magnificent array of homes in the Neo Grec, Romanesque Revival, Queen Anne, Italian and Federal style. The price range of these incredible homes has gone up dramatically and is in the multi-million dollar range. The rental prices in this neighborhood have also skyrocketed. For example, a studio apartment now rents for approximately $2,500.00 per month, one bedroom asking $3,500.00 and two bedrooms asking $4,700.00. Because of Ft Greene's popularity with renters and new home buyers there is high demand for new housing and several major residential projects are underway and set to launch in this neighborhood. The Empire warehouses are located in the Empire Fulton Ferry section of Brooklyn Bridge Park at 53-83 Water Street. These buildings were built by architect Thomas Stone in 1869 and feature distinctive brick walls with round arch openings and iron shutters. The warehouses consist of seven contiguous buildings, four and five stories in height. Ten design firms have submitted proposals to the Community Advisory Council (CAC). These proposals are aimed at generating income for the Brooklyn Bridge Park maintenance, preserving, restoring and reusing the landmarked buildings and transform the buildings into an exciting and dynamic destination that will work well with the park and the surrounding area. The designs include retail, office and cultural space. While a lack of a listing inventory of properties for local Brooklyn Realtors and real estate brokers to sell continues to be a problem, according to The Real Estate Board of New York in a recent published report, Brooklyn residential sales prices and activity are up. Comparing the number of residential sales in first quarter of last year to the first quarter of residential sales this year, Brooklyn showed a 21% increase or $1.6 Billion while residential sales in New York City was up 23.4% or $8.1 Billion. Brooklyn's continuing popularity with buyers seeking a neighborhood with hipster appeal, great nightlife and close proximity to Manhattan has made Williamsburg Brooklyn a prime destination in New York. With Williamsburg's strong attraction to young singles and now young families local realtors, brokers and agents have seen an ongoing demand for properties for sale even in this difficult New York real estate market. With the purchase of the defunct Domino Sugar Factory on the Williamsburg waterfront for $186 Million last year the developer Mr.Jed Walentas, principal of Two Trees Management Company, is now planning to attract large companies such as Yahoo and JetBlue to Williamsburg Brooklyn, NY. The construction of new Brooklyn residential properties had been greatly affected by the last recession. As a result, we are seeing much more development of rental units as opposed to condominium units. A slow economy and low consumer confidence along with the banks tight lending practices resulted in some development projects that were originally planned as condos to be switched to rentals. For example, one of the development opportunities that we at Accord Real Estate Group have in our inventory was planned as a high end condominium project. The sadness of a loved one passing away is unmatched. Sometimes there is an additional burden of having to deal with the sale of the loved ones real estate property. This is where our experienced real estate professionals are here to help you and your family and lessen the weight of this important matter at this most difficult time. Professionalism and Compassion are the core of how we help our clients when selling estate properties. Having marketed and sold hundreds of estate properties over the course of many years, we at Accord Real Estate Group have the experience to insure the sale of the property will be smooth and with least amount of distress for you. We are experts at the appraisal, marketing and sale of estate property. Selling a Property in Brooklyn New York? The National Association of Realtors show through the years that 80-90% of property owners who sell their property worked with Real Estate Brokerage companies. Experienced realtors will achieve a much higher sale price for their client’s property compared to the sale price by the property owners on their own. What are the reasons for this high percentage of success that sellers have with experienced realtors? 1) The majority of real estate brokers and agents take pride in their profession and have years of valuable experience. 2) Many realtors are technologically savvy and have all of the latest gadgets to access information and communicate with buyers and sellers instantly. 3) Many real estate companies have a hardworking, dedicated staff of brokers and agents who provide personal attention to their buyers and sellers. 4) There are a select few real estate companies who have a custom built real estate website that is not a boiler plate web site and that truly communicates their company’s goals and message to their clients. The above is true for many real estate companies and their brokers and agents. Now, you need to decide who to choose to be hired as your real estate broker to handle the marketing and sale of your most valued asset - your home and or your investment property. The answer to this question is, believe it or not, relatively simple. There is no doubt that the housing market in Brooklyn New York has improved over the last 2 years. Sales of residential, commercial, mixed-use and investment properties have increased. However, many Brooklyn neighborhoods have a low inventory of properties available for sale at this time, especially Brooklyn neighborhoods in the Northern section of the borough such as the neighborhoods of Williamsburg, Greenpoint, Bedford Stuyvesant (Bed Stuy), Bushwick, Clinton Hill, Downtown Brooklyn, Brooklyn Navy Yard, Brooklyn Heights, Fort Greene (Ft Greene), Prospect Heights, Carroll Gardens, Cobble Hill and Boerum Hill. 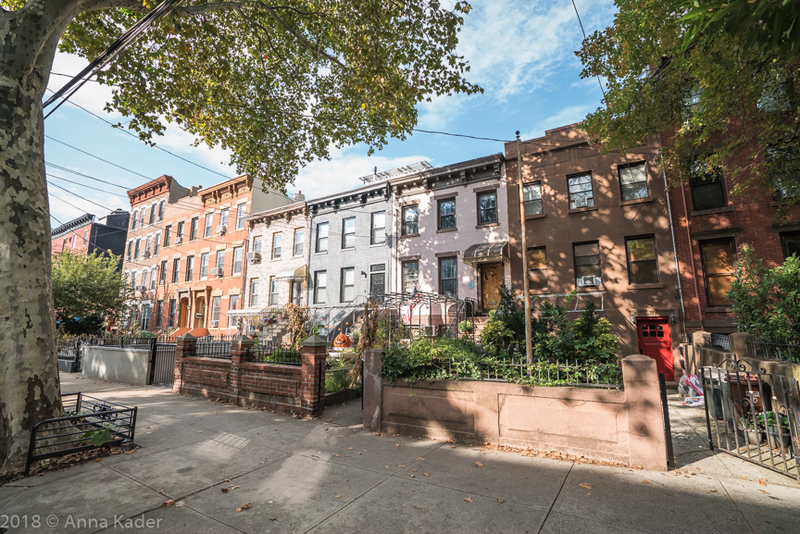 These Brooklyn neighborhoods are in very high demand for housing and investing because of their close proximity to Manhattan (NYC) and their uniqueness of character. The old time, traditional way that the real estate brokerage profession has worked, involved real estate brokers, realtors and agents sitting in an office and working with residential and commercial properties, servicing buyers, sellers and renters. The neighborhood where the office of the real estate brokerage company was located in was considered "their territory". 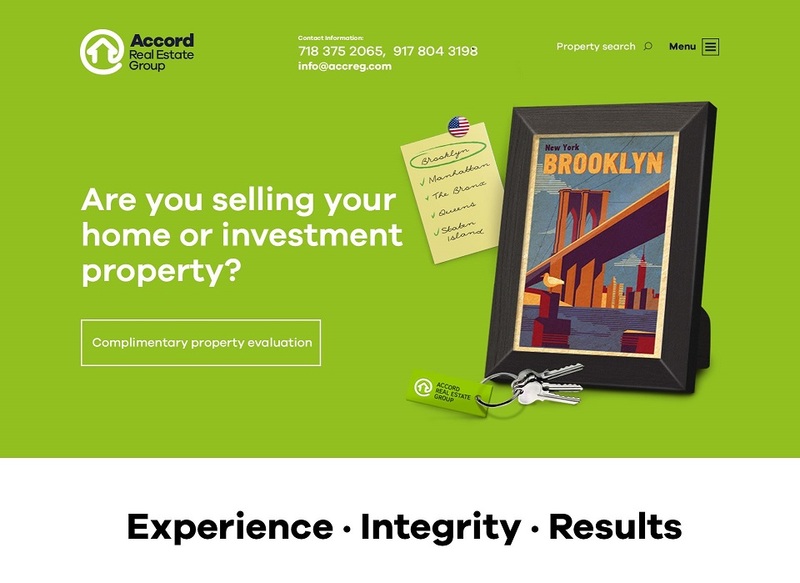 Accord Real Estate Group is a licensed Brooklyn real estate broker that specializes in representing property owners in the marketing and sale of their Brooklyn real estate properties. The property can be a house for sale, commercial property, mixed use or investment property, land or development opportunity, co-op apartment and commercial or residential condominium for sale. Firstly, Anna and I want to wish everyone Happy Holidays and a Healthy, Happy and Prosperous New Year! The Accord Real Estate Group real estate brokerage company was blessed with a successful year of a great inventory of homes, investment properties and several development opportunities that we successfully marketed and went to contract on and closed on. We thank our wonderful clients for the opportunity to represent them in the sale of their Brooklyn real estate. We have experienced in this past year that the Brooklyn Residential and Development Opportunity segments of the Brooklyn Real Estate Market are strong and the new year will be a strong one as well. Just this past Sunday, I attended a birthday party for a friend. The topic of conversation that dominated the afternoon was super storm Sandy. I am certain that the tragic loss of life and devastation of whole communities that Sandy caused will forever remain in every New Yorker's mind and heart. Most Brooklynites, who own homes in the Brooklyn neighborhoods not effected in any significant way by Sandy have long since gone back to their normal lives. The homeowners whose property is located in coastal neighborhoods in Brooklyn, that were badly effected by Sandy are gradually pulling themselves up by the bootstraps and working very hard to get their homes and lives back to normal again. An example of the fortitude of one woman who is a homeowner in Manhattan Beach (a neighborhood very badly hit by Sandy) is a real estate broker, the co owner of Accord Real Estate Group and my business partner and friend of 11 years Anna Kader. Anna's home was significantly damaged by the storm. Through weeks of negotiating with contractors and insurance companies, overseeing renovations, shopping for materials and working through the nightmare of a process of cleaning up and rebuilding her home, Anna and many other Brooklyn homeowners are getting the job done! The effect that Sandy is having on the Brooklyn Real Estate market will vary from neighborhood to neighborhood and property to property. In the long term however, residential and commercial property sales in even the worst hit Brooklyn neighborhoods will rebound and the future of real estate in Brooklyn NY is still very bright. For more information about Brooklyn Real Estate, call or email us. We will be happy to assist you in every way we can. Hurrican Sandy has deeply affected the lives of so many people, it was the largest Atlantic hurricane on record. Most of us did not want to believe that it would be as devastating as it was. Although power has been restored to many areas affected by Sandy there are still thousands of Brooklynites without power or running water or even worse - without a roof above their heads. As a lifelong Brooklyn resident, I lived with my identical twin brother Jay and our parents in Brighton Beach when we were young children. I have many very happy childhood memories of those years going to Manhattan and Brighton beaches, the boardwalk, Coney Island, Lundy's restaurant (designated as a landmarked building) on Emmons Avenue, in Sheepshead Bay for the best seafood dinners around. As an adult and a licensed real estate broker for the past 25 years, I have been servicing the coastal neighborhoods of Manhattan Beach, Brighton Beach, Sheepshead Bay, Sea Gate, Coney Island and Red Hook amongst many other non coastal Brooklyn neighborhoods that were also badly affected by the super storm. After driving around these neighborhoods, seeing for myself, and talking to many neighborhood residents about the devastation that Hurricane Sandy left behind, at Accord Real Estate Group our hearts go out to the many, many folks whose lives were changed by Sandy from losing family members, having their home and personal property destroyed and dreams shattered. We sincerely want to help our neighbors and friends and anybody in needs in any way that we can. Whether it be by giving helpful information, referring good plumbers or electricians or just to listen to you. We understand you maybe more because unfortunately some members of our team are also suffering the devastating effects of the hurricane. Please click on the links below for some helpful information. We will be honored to help you. Do not hesitate to call us at 917-804-3198 or 718-375-2065. 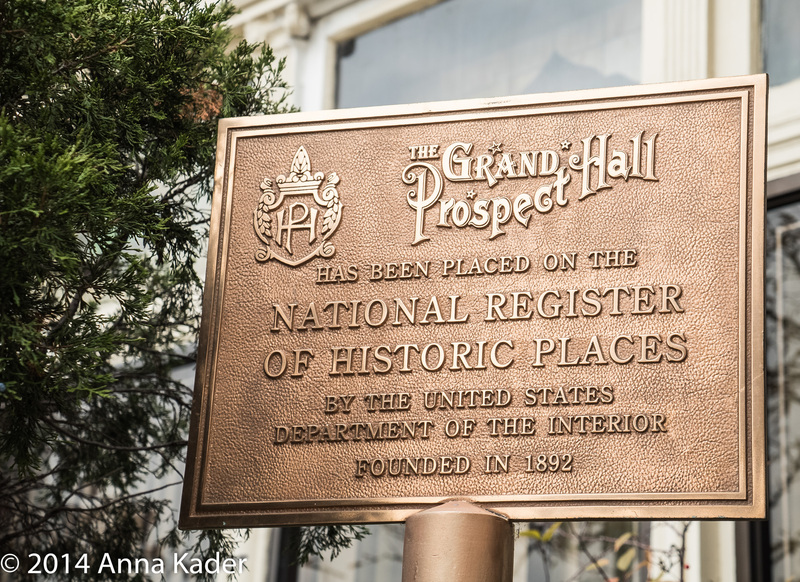 In the ever changing real estate landscape and the trend of shifting boundaries of Brooklyn New York neighborhoods, Prospect Heights is one such neighborhood. There are many Brooklyn neighborhoods that have already experienced this trend. They are South Slope, the neighborhood that got its name from its neighbor to the east Park Slope, in an effort to capitalize on the allure and prestige of Park Slope. The boundary shift has also happened in Borough Park that now includes part of the Kensington neighborhood such as Parkville Avenue and Dahill Road; Manhattan Beach which now includes Corbin Place that used to be part of the Brighton Beach neighborhood; Fort Greene and Brooklyn Navy Yard; Clinton Hill and Bedford Stuyvesant, Williamsburg and Bushwick also have gone through the neighborhood boundaries change. Growing up in Brooklyn, New York as a kid and then young adult, graduating from Brooklyn College and now as a licensed real estate broker marketing and selling properties in Brooklyn for over 25 years, I have had a unique opportunity to witness the evolution of Brooklyn, New York real estate. Even as a young kid, my identical twin brother and I would ride our bicycles through different Brooklyn neighborhoods to visit our friends. Things were much different then. Real estate in many spectacular Brooklyn neighborhoods has a rich historic architectural mixture influenced by residents from countries as varied as new comers who came here to live. Brooklyn New York real estate is in high demand like never before! While Brooklyn real estate has seen years of incredible value appreciation and sky high prices as well as a decline in value as a result of the economic, mortgage and housing crisis of 2008-2009, the market forces unique to Brooklyn real estate have stabilized since late 2011. The Brooklyn real estate market continues to remain stable resulting in increased selling and buying activity in many neighborhoods. Williamsburg is one of many spectacular neighborhoods in Brooklyn New York that is in high demand by young families who are looking for a great place to live, raise their families and put down roots. And it’s easy to understand why. Besides an easy commute to New York City, families can choose from gorgeous new condominium constructions that have a spectacular views of Manhattan as well as coop apartments and 1,2 or 3 family houses. When you are planning to sell your Brooklyn New York property for the highest, yet a realistic price, it's best to get advice from experienced Real Estate Brokers and agents. Please keep in mind that your property is worth, the most that the real estate market will bear at any given point in time, according to where the property is located (location, location, location), what the property type is (residential, commercial, mixed use, co-op, condominium, vacant land or a development opportunity) and what the current market conditions are in your specific neighborhood in Brooklyn. As Brooklyn Real Estate Broker for 25 years and Broker/Owner of Accord Real Estate Group I would like to share with you my understanding of the disappointing year to date sales statistics in Sheepshead Bay, Brooklyn. 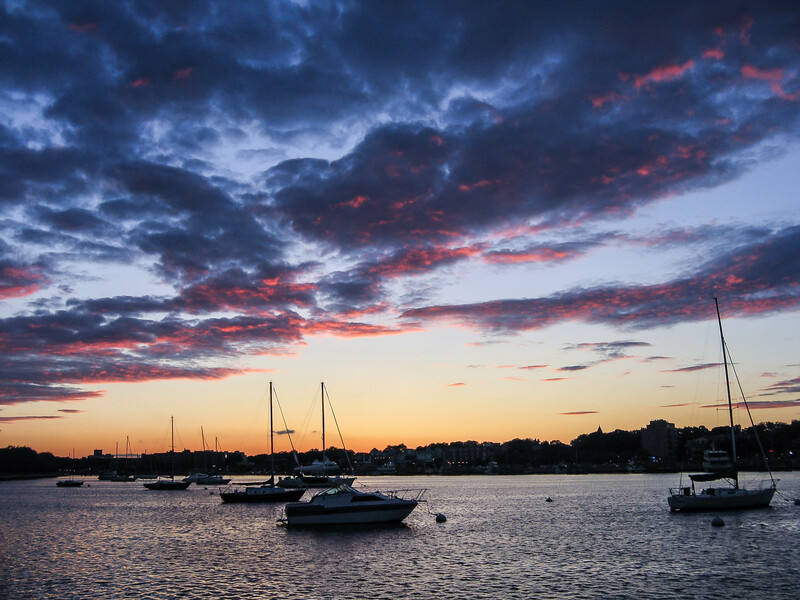 Even though the recent sales data for residential real estate indicates a decline in total sales from 78 in 2011 to 63 in 2012 for the period between May - August 2011 and May - August 2012, the sold prices have held steady for residential real estate in Sheepshead Bay Brooklyn, which is a good news. The breakdown for 2011 sales is as follows: 1-3 family homes - 28 sold, co-ops and condominiums - 50 sold. The breakdown for 2012 is 1-3 family homes - 22 sold, co-ops and condominiums - 41 sold. The Real Estate and Development Committee of The Brooklyn Chamber of Commerce, held its 12th annual Building Brooklyn Awards Ceremony on July 12th. Award category Civic/Institutional, award recipient is BLDG 92, located in The Brooklyn Navy Yard and details the history and current use of the yard with an interesting and fun emphasis on ships. There has always been a group of "players" so to speak, that is in the business of Buying, Fixing and Selling properties and a group specializing in developing new condominium and mixed use projects in many established and emerging Brooklyn, NY neighborhoods. We are seeing an increase in recent months in the number of people looking for investment and development opportunities in Brooklyn. There are several reasons for this like the weak economy and unpredictable stock market has created the necessity for many people to find alternative careers and ways to invest their money. This is where you can share your best nightclubs and fun places to eat: anybody can log in and post, just keep it clean or you will be blacklisted! "What a difference a year makes", states Jeff Grandis of Accordrealestategroup.com. Last year at this time both buyers and sellers were completely confused about the change of market forces from a seller's market to a buyer's market. As a result many buyers sat on the fence and did not buy, thinking that the market will finally crash and prices will tumble. Well, according to Jeff Grandis in fact there was a price adjustment downward in many Brooklyn Neighborhoods. The adjustment was as much as 15% in some neighborhoods and less in others. For example, Midwood, Madison, Gravesend, Homecrest, Sheepshead Bay experienced a significant price adjustment. The downtown neighborhoods of Dumbo, Park Slope, Fort Greene, Clinton Hill, Carroll Gardens, Cobble Hill, Boerum Hill, Brooklyn Heights, Williamsburg and Greenpoint underwent a less severe downturn in price. Many sellers realized that the time of tremendous increases in price for their properties was over. Now, if a seller wants to sell, they have to be much more realistic about their expectations price wise says Grandis, who has been listing and selling Brooklyn Real Estate for over 19 years. According to Jeff Grandis, 2007 should be a much better real estate market. Now most sellers and buyers understand the changes that the Brooklyn real estate market have undergone. It was like a big storm, and now there seems to be a welcome calm. Sellers now know that they have to be realistic about price and buyers now know that prices have stabilized so if they need to buy, now it is a great time.